Since we are making an active effort to encourage families to take an increased role in their children’s educations, Bunty told the parents of the children in question to head to the school to get more details, and that she would be over shortly to sort things out. When the parents arrived at school, they were alarmed to see their children scared and crying, and were told by the teachers to keep their distance and not to get worked up. By this point, our Education Program coordinator, office manager, and counselor had shown up at school to check in with the parents and teachers, and learned that the children had been beaten by several teachers in connection to the theft. Back at the Education Centre, with AIC Directors, parents, and other students who had witnessed the incident, the full story came tumbling out. According to the children, the entire school had gathered for a routine daily assembly that morning. Mid-way through the assembly, four of AIC’s boys in Standard 5 were called up to the front. Not knowing why they had been called, the boys went up onto the stage. A fifth AIC student was dragged onto the stage as well, and managed to escape, but not before the teacher threw his shoes at the boy as he fled. In the face of sustained physical assault, the boys begged the teachers to stop beating them and let them go, promising in desperation that they would try to collect money to give to the teacher whose money had gone missing. By this time, one of the boys had completely wet himself in sheer terror. Finally, the boys were released and the school assembly continued on as if nothing had happened. Upon hearing this shocking account, AIC Directors Bharati and Bunty headed immediately to the school, where they encountered the main teacher in question. When confronted, he readily agreed that they had beaten up the children at the assembly, and said that he was only helping the children by disciplining them. Furthermore, although it should have no bearing on the situation (since even if the boys had been caught red-handed stealing money, it would not even begin to excuse the brutal physical assault that occurred), he also confirmed that he had no proof of the children’s involvement in the missing money and had simply assumed their guilt. This teacher – who also holds a role within the school as the head of the disciplinary committee – became aggressive and belligerent with Bharati and Bunty when they expressed their shock at his actions, and told them that AIC could do whatever it wanted about the situation. The rest of the day was a blur of activity that stretched until nighttime. 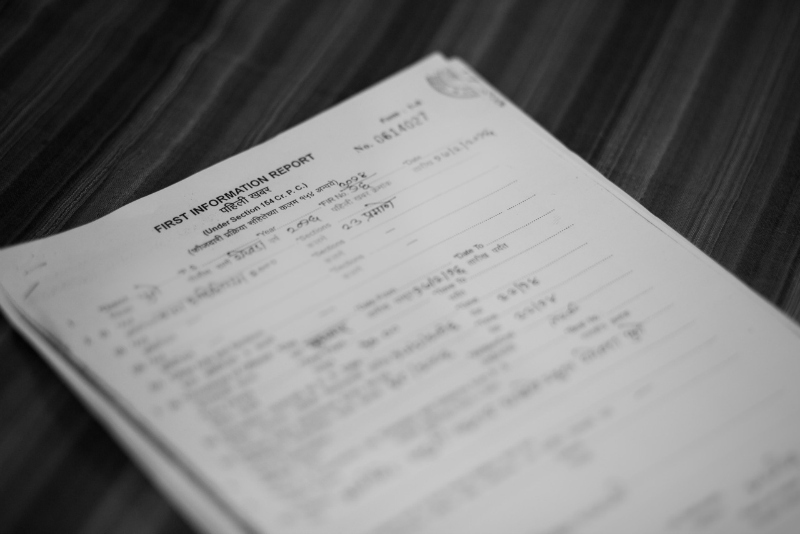 After urgent meetings with parents and community members and consulting lawyer contacts, Bharati and Bunty, with support from various other team members, filed an FIR (First Information Report) at the local police station against the teachers who had committed the assault. Also mentioned in the police report was the fact that corporal punishment (to a lesser but still serious extent) against AIC’s students has been reported to the school principal by AIC employees numerous times in the past, with no discernible action taken or changes made. The practice of abusing children verbally by attacking their psyche occupies the top rank in the list of punishments in school. 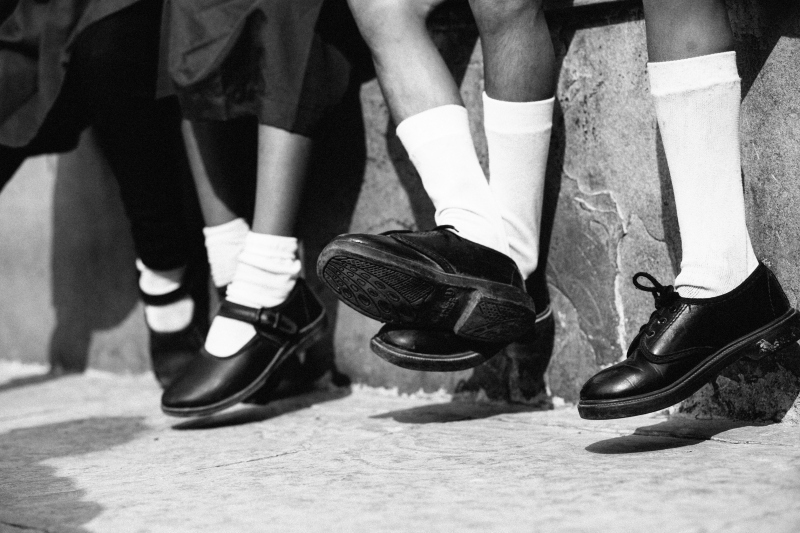 As many as 81.2% of the children were subjected to outright rejection by being told that they are not capable of learning, reports a recent study ‘Eliminating Corporal Punishment in Schools’ by the National Commission for Protection of Child Rights. The study surveyed 6,632 students across seven states. Three out of five school children, in the 3-5 age group – that’s how early it starts – were beaten with a cane as a form of corporal punishment. An alarming 99% had experienced some of corporal punishment – the four most common forms of physical punishment being beaten by cane, being hit on the back, getting boxed on the ears and being slapped. There is no doubt that the violence against children in schools has reached unacceptable levels. And despite the regular guidelines against corporal punishment by the government, court judgments declaring it illegal, constitutional provisions that protect children, sections under the IPC relating to physical harm and intimidation that can be used against offenders, the RTE Act – corporal punishment continues to be an accepted practice in India and is often shrugged off as part of growing up. Unfortunately, giving the system a shake is a major, complicated undertaking, and AIC began to experience immediate retaliation for having taken action against the perpetrators of this incident. 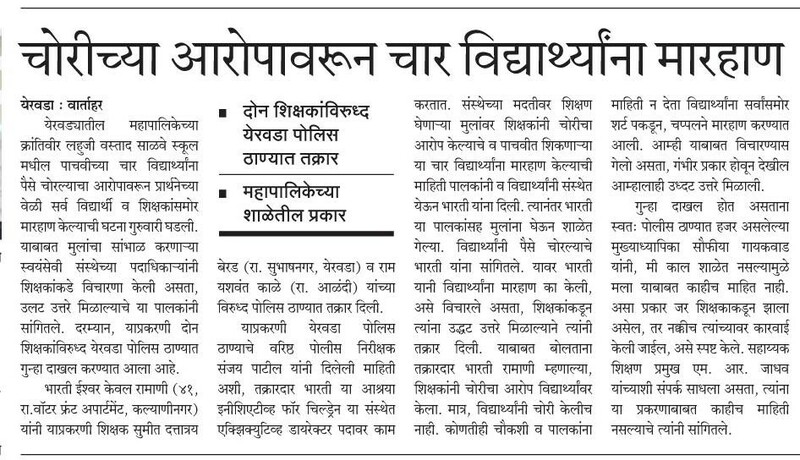 Since this unfolded last week and several major newspapers published accounts of the situation in both Marathi and English, AIC has experienced pressure and threats from multiple sides to withdraw the complaint against the teachers. Politicians, other teachers at the school, an intermediary NGO, school board officials and numerous others have all joined the chorus for us to drop the complaint and go on with our lives, continuing to send our students to a school environment that is both dangerous to their physical well-being and treats them with outright hostility. Our leadership team has been receiving a barrage of calls and pressure for various meetings to work out an “agreement” of sorts, one that does not appear to entail any significant repercussions for the perpetrators of this crime. The boys, who have slowly begun to return to school after initially feeling too afraid to face their teachers and peers, have been asked for their parents’ contact information by school administrators seeking to put pressure on the boys’ families. Two of the boys reported being cornered by the principal of the school and interrogated about what they had told others about the incident. Other students at the school reported that AIC students were asked to leave the room when teachers spoke with classes in advance of police investigators visiting the school to take down witness statements. Most concerningly, unidentified individuals have made their way into the Waghri slum looking for the children in question, and others have attempted to meet with the head of the Waghri panchayat to tell him to convince us and the children’s parents to drop the complaint. Suffice it to say, there are forces actively working against justice for the boys who were assaulted and obstructing accountability and acceptance of responsibility at the school level. Thankfully, the local police have been extremely supportive and accessible to our team members in the face of these threats. The entire community is on high alert with regard to the children’s safety (how ludicrous it is that we should even have to fear for the safety of the children who have already been through so much!) and stands united, determined not to give in to pressure or buckle under threats. Let us be perfectly clear: by filing a police report against the individuals responsible, we are not seeking retaliation or revenge, nor do we want to make enemies unnecessarily. However, at the end of the day, it is our job to defend and protect the children in our care, and to demand change and accountability when something as inexcusable as this occurs, thus we cannot ally ourselves with individuals or institutions that are causing our children harm or covering up crimes. That they are not worthy of respect and dignity? That the adults in their lives who have a duty to protect them from harm do not care about their physical and emotional well-being? That violence is an acceptable way for grown, supposedly well-educated men to vent their frustrations and attempt to manage the behavior of 11-year-old children? That it is ok for Indian society to continue to publicly label AIC’s children as “criminals” and write them off as problem-children, delinquents, thieves, or worse? That we tacitly condone an incident that occurred for the sole purpose of publicly humiliating and harming children? This was an act of calculated cruelty, designed to remind our children who they are and where they come from, in a public forum. Many are still unaware that the Waghris community was legally branded a “Criminal Tribe” under the British government’s Criminal Tribes Act of 1871, meaning that every man, woman, and child of these communities was labeled “criminal by birth,” “addicted to crime,” belonging to “a racially inferior criminal caste,” “wild and wandering,” and other appallingly prejudicial language. For generations, community members of all ages could be rounded up, harassed, arrested, extorted, and even killed with impunity under this Act. By all accounts, when a crime was committed in a particular area, these populations could expect to face arrests or worse on the basis of mere suspicion that they must have been involved – a scenario that shares unsettling parallels to last week’s incident. Though the Criminal Tribes Act was repealed in 1952 (and Criminal Tribes were reclassified as “Denotified Tribes”), a new Habitual Offenders Act was enacted in its place the same year, and its discriminatory effects persist to this day, continuing to circumscribe the lives of the two communities with which AIC works. These are communities that AIC has spent literally an entire decade convincing of the merits of education and the importance of sending children to school – only have to have such efforts undermined in one fell swoop because individuals who should not be educators decided to try their hands at vigilante justice. At this point, we are waiting to see how the situation will continue to unfold. No matter what it takes, we will not stand by idly as our children are used as a punching bag for teachers and administrators who enjoy abusing their power to terrorize and humiliate students. Enough is enough; it is time to stand up and fight for change.